Designed in 1910 this 18 hole parkland course nestled in the Surrey hills near Godalming offers tree lined fairways and views which would be suited to any picture postcard. The course was comprehensively upgraded in 2002 to boast a fairway watering system and greens to USGA standards and in 2015 a range of new John Deere machinery to keep this tranquil course at the standard the players expect. Alec Maclndoe, Course Manager, joined West Surrey Golf Club 14 months ago and as a long term user of John Deere equipment was keen the club should “go green” when it was time to renew the kit. 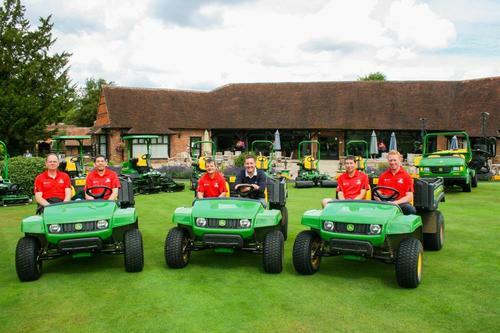 “I have been a user of John Deere equipment for nearly 20 years and have always been and still am impressed with the build quality and reliability of the machines” Alec worked closely with Farol Golf & Grass Director, James Moore, to make sure the kit for West Surrey was suited for the task. The package of 20 machines is on a 5 year operating lease and all supplied by John Deere Golf & Grass Machinery dealer, Farol Ltd.
Keeping the fairways managed are a pair of 7700A PrecisionCut fairway mowers offering an impressive 100 inch (254cm) cut with a top mowing speed of 8mph. New on the 2015 models is TechControl allowing quick setup of speeds and machine settings maximising efficiency at West Surrey. Mowing semi rough, bunker edges and surrounds is carried out by the clubs two 7200A PrecisonCut Reel mowers. These well-balanced machines provide superb manoeuvrability around the course and Alec is impressed with the Speed Link system for easy reel adjustment and maintenance. Four 2500E E-Cut Hybrid mowers were favoured by Alec in the package to manage the greens at the course. “I have been using 2500E machines for over 10 years and with the risk of hydraulic leaks, having electric reels has eliminated this and also meant lower noise levels without compromising on cut quality. The staff really like the 2500E as they also use less fuel so no need for refills during the day” The 2500E feature three 22inch (59.9cm) cutting units giving a total 62 inch (157.5cm) cutting width powered by a 19.6hp diesel liquid cooled engine. All of the spraying at West Surrey is easily managed by the John Deere Pro Gator and HD200 sprayer with 6.4mtr boom. The tight turning radius and low centre of gravity make this the ideal vehicle around the course and a top speed of 31km/h allows it to travel around West Surrey quickly and efficiently. For general transport and maintenance, four TX Turf Gators were chosen with suitable Cayman turf tyres so they can travel anywhere on the course. The impressive 454kg load capacity mean staff and equipment can be transported quickly and efficiently. To complement the John Deere equipment in the package was a Wiedenmann GXi8 TerraSpike aerator with the exclusive Quick Fit tine system. A Wiedenmann Mega Twister blower to keep the course clear and tidy with the minimum of noise and a Tru-Turf RS48-11E greens iron makes sure the greens are always up to the required USGA standards. I must say after visiting West Surrey Golf Club I can certainly see why it has been voted in the top 50 parkland courses as some of the views are truly spectacular across the Surrey landscape and the tranquillity must make it a joy to play. Rest assured with the knowledge of the course under management from Alec and a stable of John Deere machinery to maintain it, this course is certainly in a safe pair of hands.